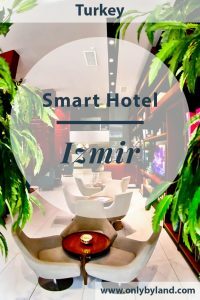 The best room rates can be found at the Smart Hotel Izmir website. Additionally the latest special offers and pictures can be found on the Facebook and Instagram feeds. 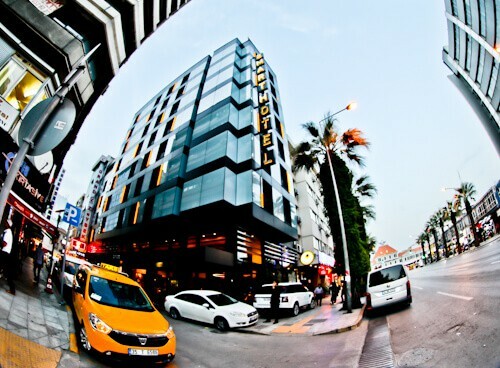 Smart hotel is an Izmir hotel located in the center of the city. From this location you can walk to all major points of interest of Izmir. In addition, there is an Izmir metro station, as well as Izmir train station less than a 5 minute walk away. In fact you can take the train from Izmir to Bandirma which connects to the fast ferry for Istanbul. There are lots of restaurants and supermarkets surrounding the hotel. 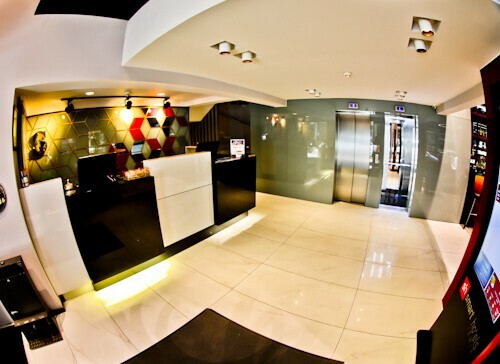 You will be welcomed to the hotel and Izmir by friendly, English speaking staff. 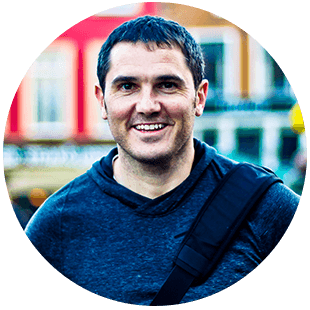 During check in the staff will explain where the facilities of the hotel are located and most importantly where the complimentary buffet breakfast is served. Located on top of the reception desk is a dish full of candies and you’re welcome to take a handful of these together with a map of Izmir. Afterwards a member of staff will take you to your smart room and explain how it works. For me, the most impressive part of the smart room is the smart TV built into the mirror. This combined with the quality of sound made watching TV an experience in itself. The guest rooms are soundproof, consequently you don’t need to worry about disturbing your neighbors. Additionally, the facilities inside the bathroom are impressive, the light around the vanity mirror is a nice touch. You may choose a private bathroom but also, at the flick of a switch you can open the blinds. As you would expect, fast and reliable WiFi is available in the guest room as well as throughout the hotel. 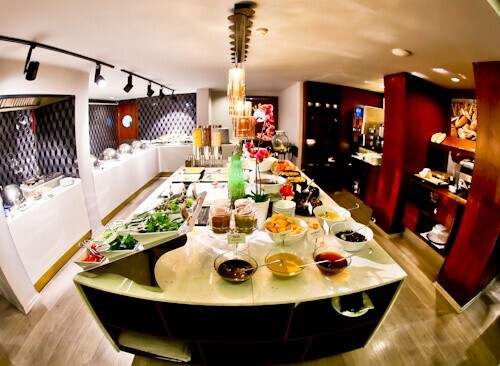 During the complimentary breakfast buffet, you’ll find all the food options required to start the day. You’ll find, hot food, salad, cold meats, cheeses, fresh breads, cereals, Turkish options, as well as an egg station. 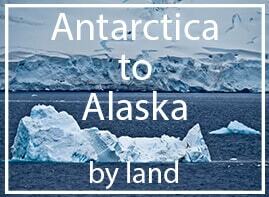 In addition, there is water, juice, tea and coffee. Breakfast staff will ensure the buffet is running smoothly and if you need anything they will be happy to assist you. Something you don’t often find in a hotel is an area to practise your putting. 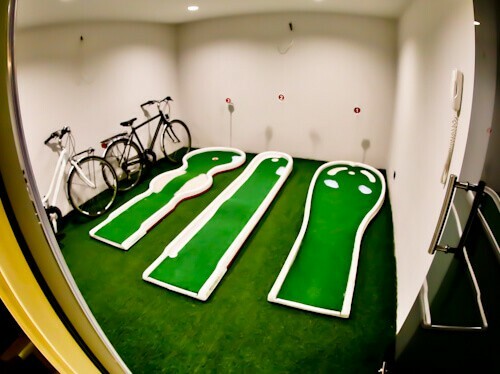 The mini golf area is especially useful for business travelers who need to work on their putting stroke. Additionally, if you’re visiting Izmir as a family, you could have a fun putting competition in this area. 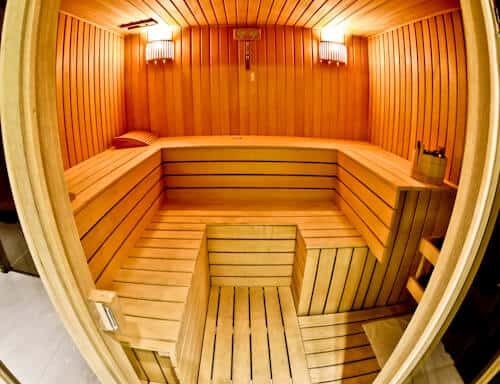 For those who cannot travel without a sauna, you will be satisfied at this Izmir hotel. The hotel basement boasts a clean, well maintained Finnish sauna. A sauna is the perfect way for business travelers to relax after a strenuous day. The fitness center at the Smart hotel contains all the equipment required to have a full workout. There are cardio machines as well as weights machines. Most importantly, you’ll find a bench so you can practise the all important bench press. 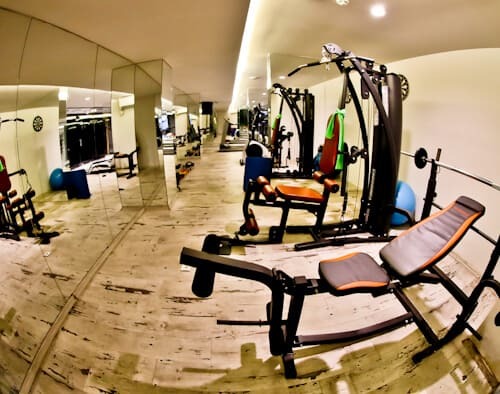 This gym is likely the most well equipped of any Izmir hotel. In addition it’s a spacious gym, which makes working out a comfortable experience. On the fifth floor there is a lounge area as well as an outdoor terrace. The outdoor terrace is perfect for smokers to sit out on and enjoy a smoke and a tea. Another key point about the fifth floor lounge is that it’s quieter than the lobby. 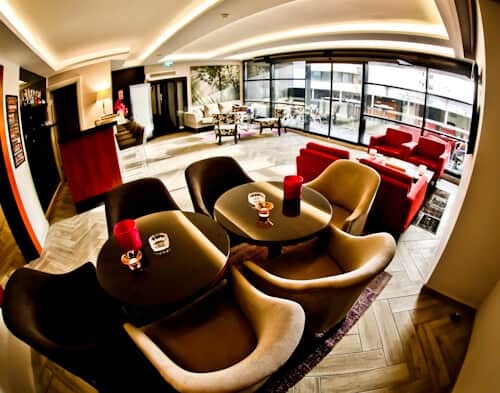 If you’re looking for a quiet place in the hotel to relax, the lounge and terrace are ideal. Enjoy your stay in the Smart Hotel Izmir and be sure to make use of the facilities including spacious fitness center, sauna and mini golf. It’s also relaxing to chill out in the lobby lounge, surrounded by green plants in a homely atmosphere. 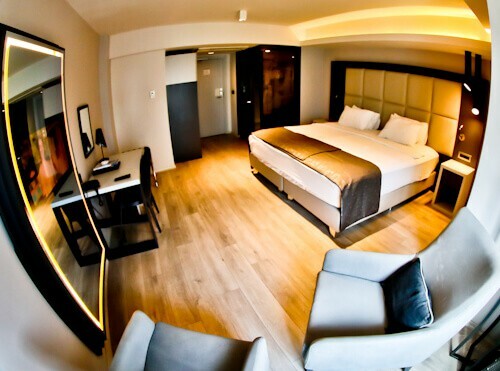 In addition, enjoy the smart facilities in your guest room, especially the smart TV built into the mirror.